New U.S. national scope census tract demographic-economic interactive tables are now available. These tables include approximately 600 subject matter items derived from the American Community Survey 2012 5-year estimates released in December 2013. Census tracts are subdivisions of counties covering the U.S. wall-to-wall and average approximately 4,000 population. Use the interactive ranking tables to view, query, rank, compare demographic-economic characteristics of the population and housing. A scroll box is provided for each section that lists each of the subject matter items available for each area in the table. These data provide “richer” demographic-economic characteristics for national scope census tracts. 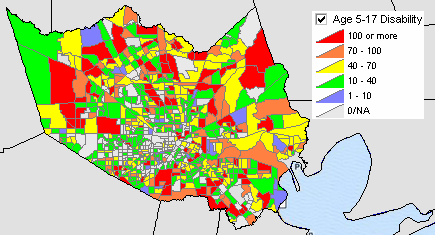 While Census 2010 provides data similar to those items in the General Demographics section, only ACS 2010, 2011, 2012 sourced data provide details on topics such as income and poverty, labor force and employment, housing value and costs, educational participation and attainment, language spoken at home, among many related items. The approximate 600 items accessible via the tract dataset are supplemented by a wide range of additional subject matter. ACS 2013 census tract data become available in December 2014. For the United States overall, electrical engineers are projected to grow from 306.1 thousand in 2012 to 318.7 thousand in 2022 — an increase of 12.6 thousand or 4.1%. These “demand-driven” projections, new in December 2013, will different from actual employment experienced in 2022 in any given metro or area. Will metros of interest experience a workforce shortage in key highly skilled occupations? How might this impact the regional economy? Cost of labor? Electrical engineer projections are shown in the following graphic relative to other engineering occupations ranked on projected employment in 2022. This section is focused on accessing and using these new, very detailed, occupational and industry employment projections for the United States to 2022. Gain insights into future employment conditions using these resources. Which occupations will growth fastest? How will change in employment for an occupation be distributed by industry? Use this interactive table (link to separate page) to query, view, rank, compare employment projections. The table shows employment projections by occupation. Click a link in the table to view the projected employment by industry for the selected occupation. Use tools below the table to perform queries on occupations of interest. Rank on a column of interest by clicking header cell. Click a link in the Code column to view the distributions of a selected occupation by detailed industry. The employment projections in the table are based on December 2013 projections developed by the Bureau of Labor Statistics (BLS). The projections are provided for 479 detailed occupations and summarized into occupational groups. These demand-driven projections differ from the ProximityOne Situation & Outlook (S&O) employment projections in several ways. The BLS projections are national level only and provide data for only 2012 and 2022; they are updated every two years. The S&O projections are available to the county level (less detail), provide annual data to 2030, and are updated quarterly and annually. The S&O projections are developed using holistic cause and effect simultaneous equation models and reflect expected, projected employment levels. The BLS projections are based on assumptions about the overall economy growth and do not include extensive cause and effect determinants. While the BLS projections may provide good demand-based employment conditions, the employment levels may not materialize due to shortages and other factors affecting the supply of labor. Join us in the next Situation & Outlook quarterly briefing session on January 16, 2014. We will cover 2030 state and regional demographic-economic patterns and trends based on the latest developments. See additional details at http://proximityone.com/dmisessions.htm. How will population change manifest itself by state, metro, region, county and city? By age and household composition? Use the demographic estimates and projections interactive table to view/rank/compare population change from 2010 to 2060 for the U.S. overall, states, metros and counties. 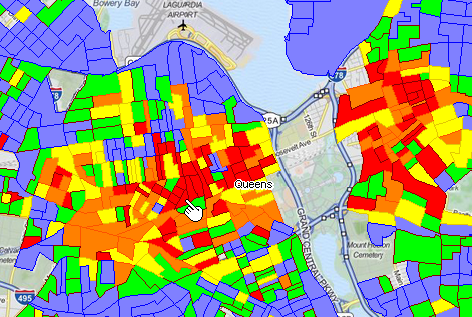 Analyze area patterns and trends and assess how areas of interest relate to each another. Estimates and projections shown in the table below are a part of a broader set of annually updated current demographic-economic estimates and projections developed by ProximityOne. The estimates and projections are developed using models that knit together a mix of historical birth, death, migration, economic and other data and assumptions. The following graphic shows the largest states by projected 2030 population and population change. Use the separate interactive table to develop this view and examine patterns among other states. This view was developed by clicking the “View 2010-2020-2030 Change” button below the table and then clicking the Population 7/1/30 column header cell to rank the table on this column in descending order. Try this operation yourself using the interactive table. The Census Bureau only develops population projections for the U.S. as a whole; there are no post Census 2010 Census-sourced state level projections. For both current estimates and projections, the Census Bureau uses a “top-down” approach. For example, Census will release the 2013 U.S. national estimates in late December 2013. The corresponding 2013 state and county estimates will be released in early to mid-2014, the state estimates controlled to the U.S. estimates and the county estimates controlled to the state estimates. The most forward looking Census-sourced state and county population data will be for 2013. Development of Census-sourced population estimates, and the national level population projections use a demographic-only model; there is no direct integration of the economy and business/economic factors. In contrast, the ProximityOne projections are developed with a “bottom-up” methodology using cause and effect simultaneous equation models. Projections are first developed using county-level demographic-economic models. County level projections are developed by single year of age by gender by race/origin and then aggregated to state and national levels. The entire projection period extends annually to 2060. View Broward County, FL projections showing more detail. See complete dataset example for Sedgwick County (Wichita), Kansas (XLS). The holistic modeling does not separate the process of developing current estimates versus projections; the cause and effect relationship is specified over time. An important role for population projections in context of decision-making information is to help us better anticipate where, when and how change will take place — and how it might impact market or service areas and business operations. To best examine impact analyses, the geographic focus needs to be on the relevant market or service area (e.g., city, group of counties, etc.) geography. Projections change over time; use of alternative scenario projections is essential. The ideal approach to impact analysis — how will my markets be impacted in 2030? — is best achieved through through fully integrated cause and effect models and not using only separately developed demographic-economic estimates and projections. Users of the Situation & Outlook modeling tools can perform fully integrated impact analyses under alternative scenarios.